Christians all know Christ died for them on the cross. But a doctor here in Indianapolis who studied crucifixion for a decade says until you understand what Jesus went through medically, it’s hard to fully appreciate just how much He suffered to pay for the sins of mankind. “The real cause of death shows up in Christ’s own prophetic words at the Last Supper. 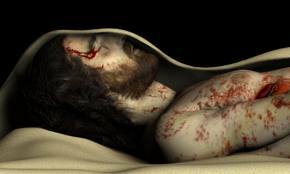 Christ knowing such a grim death was racing towards Him would be one explanation for the odd occurrence of Him sweating blood in the garden of Gethsemane.